Madeira is mostly famous for its fortified wines. Even if Madeira’s cuisine is largely inspired by continental Portuguese cuisine, there are some noteworthy exceptions such as Bolo de Caco, Espetada Regional, Espada com Banana, … and Milho Frito. 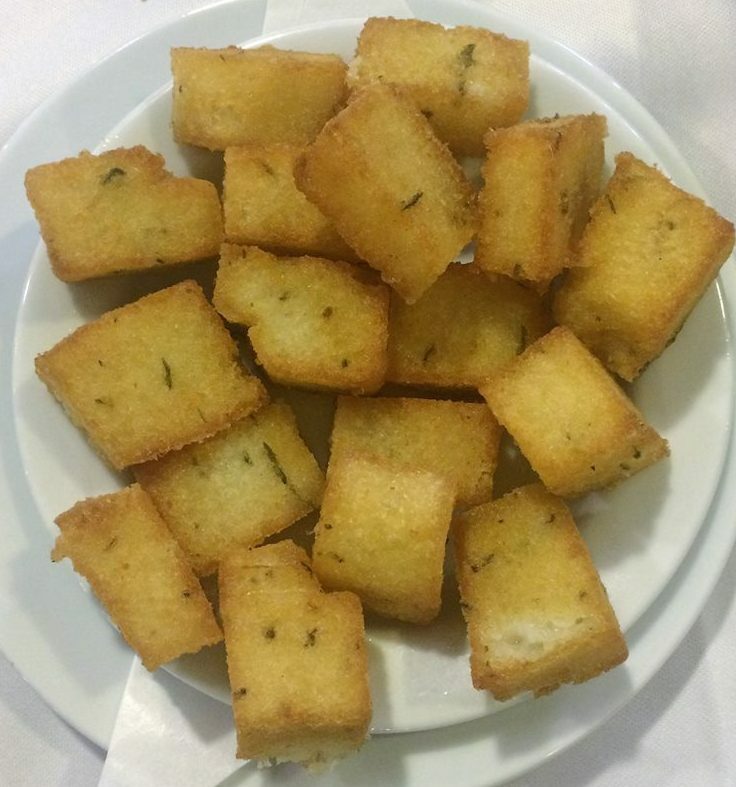 Milho Frito or Madeira Fried Cornmeal is a crispy fried dish, somewhat similar to polenta fries or cubes. Many recipes circulate on the island, this is the one we use which is a combination of many as well as our trials and errors. 1 tbsp. coarsely chopped fresh thyme and mint / mint can be replaced by basil. The original recipe calls for minced kale leaves. In a medium saucepan, melt the butter over medium heat or heat the vegetable oil for the vegetarian version. Add the garlic and fresh thyme (with mint or basil) or stick to the original recipe and add the minced kale leaves and cook without coloring until fragrant, 3–4 minutes. Add 1 liter of vegetable broth a low boil. Slowly add the corn meal while whisking. Mix thoroughly. Add the chopped sweet red pepper and salt. Stirring constantly, bring the mixture to a low boil, then reduce the heat to maintain a very low simmer and cook, stirring occasionally, until the broth has been absorbed and the mixture is thick. Lightly grease a large rectangular glass baking dish with olive oil, then pour the mixture into the pan, smoothing the surface with the back of a spoon. Cover and refrigerate for at least several hours. You can also prepare the mixture until here and let it cool overnight. A few hours later once cold or the following day, invert the pan onto a cutting board to unmold. Cut into 2cm by 2cm, or 2.5cm by 2.5 cm cubes and set aside. 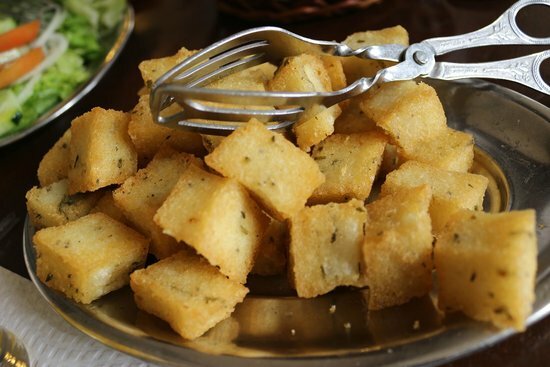 Deep fry the cubes in hot vegetable oil for a few minutes until golden brown and crispy. Drain on large platter lined with paper towel and then serve at once. Milho Frito is a marvelous side dish which nicely replaces Belgian Fries or potatoes. 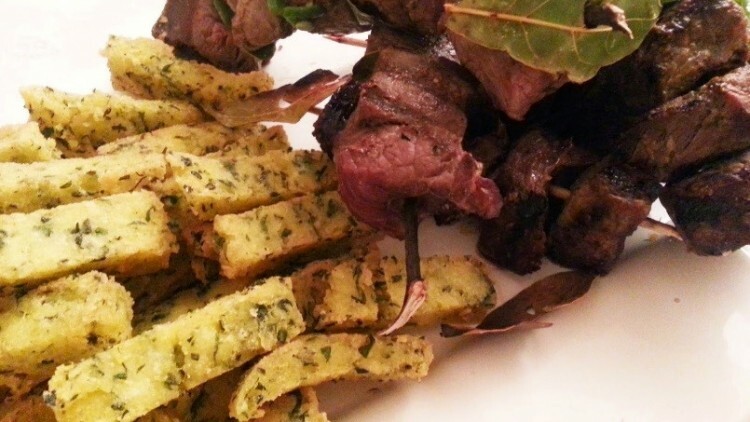 Milho Frito often accompanies the espetada regional or Madeira meat skewers. However, it can be found alongside many other dishes or eaten as a snack. Furthermore, Madeira Fried Cornmeal is a vegetarian / vegan and gluten-free treat.